With a number of players’ contracts expiring during the next two years and limited cap space available, the Chargers have re-signed five of its own free agents during the first week of free agency, as well as veterans Thomas Davis and Tyrod Taylor. Having advanced to the divisional round of the playoffs last season, retaining in-house players will be key to stabilizing the continuity of the roster that gelled so well together en route to a second place finish in the AFC West with a 12-4 record and the team’s first return to the postseason since 2013. However, with the release of Jahleel Addae, the team appears to have an opening at free safety. Do the Chargers stand pat and let Adrian Phillips and Desmond King compete to fill the void or does General Manager Tom Telesco opt to sign a veteran safety with more experience to man the secondary? Despite their limited action in free agency thus far, Touchdown Wire recently listed the Chargers No. 4 in its latest NFL power rankings. Per Gavino Borquez (ChargersWire), “The loss of wide receiver Tyrell Williams stings a bit, but he wasn’t the offense’s top option. 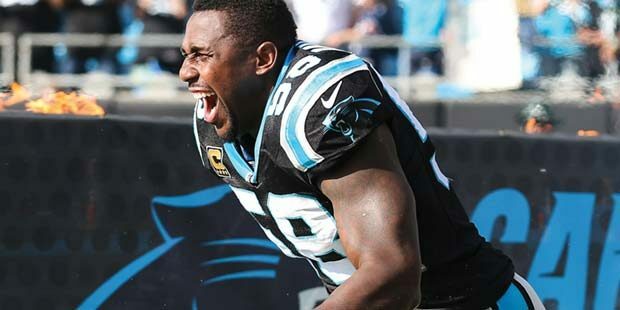 The addition of linebacker Thomas Davis is a nice pickup to help lead their young core on defense. “The Chargers re-signed a few of their players, brought in linebacker Thomas Davis and quarterback Tyrod Taylor, while only losing cornerback Jason Verrett and wide receiver Tyrell Williams to another team thus far. With the draft a little over a month away, here is our look at the latest mock drafts. While some prognosticators have already listed their second and third mocks, others have just recently put out their first mocks of 2019. Although most analysts still have the Chargers selecting a defensive player at No. 28, only two — Daniel Jeremiah and Charles Davis — have the Bolts taking a safety. * Jeremiah had the Chargers taking Alabama LB Mack Wilson in his 1st mock. * Brooks had the Chargers taking Ohio St. DT Dre’Mont Jones and Michigan LB Devin Bush in his 1st and 2nd mocks, respectively. * Kiper had the Chargers taking Clemson DT Christian Wilkins in his first mock. * McShay had the Chargers taking Jerry Tillery in his first two mocks. * Reuter had the Chargers taking Kansas St. OT Dalton Risner in his first two mocks. Easterling also has the Chargers taking Washington OT Caleb McGary in the 2nd round; New Mexico St. LB Terrill Hanks in the 3rd round and Buffalo QB Tyree Jackson in the 4th round. The Endzone: Six Chargers were recently named among the Top 101 Free Agents by NFL.com’s Gregg Rosenthal and Chris Wesseling. Below is a look at their evaluations. * Williams signed a four-year, $44 million contract with the Oakland Raiders. * Perryman signed a two-year, $12 million contract extension with the Chargers. * Verrett signed a one-year, $3.6 million contract with the San Francisco 49ers. No. 50: Adrian Phillips. “A former special teamer, Phillips earned his first Pro Bowl nod as a linebacker/safety hybrid in 2018. Its fair to wonder if he’s best suited to Gus Bradley’s defense, which makes heavy use of dime packages.” *Phillips re-signed with the Chargers for one-year, $1.5 million. * Liugit remains unsigned as we went to print. * Philon signed a two-year, $10 million contract with the Arizona Cardinals. PFF’s take on the Chargers’ moves during the first week of free agency, “Despite the losses of Jahleel Addae and Jason Verrett, the Chargers secured the middle of their defense by resigning Denzel Perryman and by signing a proven veteran in Thomas Davis.